Baltimore City's long history has crafted neighborhoods with colorful stories and unique traditions. The community of Pigtown, located along Washington Boulevard, has a past that you can probably guess centers around all things swine. The neighborhood was home to railroad workers constructing the B&O line in the 1840's. Once completed, the railcars from the Midwest would drop off carloads of pigs to be herded from Washington Boulevard through Ostend and Cross Streets to make their way to South Baltimore to be processed. This spectacle of hogs meandering through the streets of Pigtown gave the area their now celebrated mascot and a rich history that both residents and local businesses are proud to share. 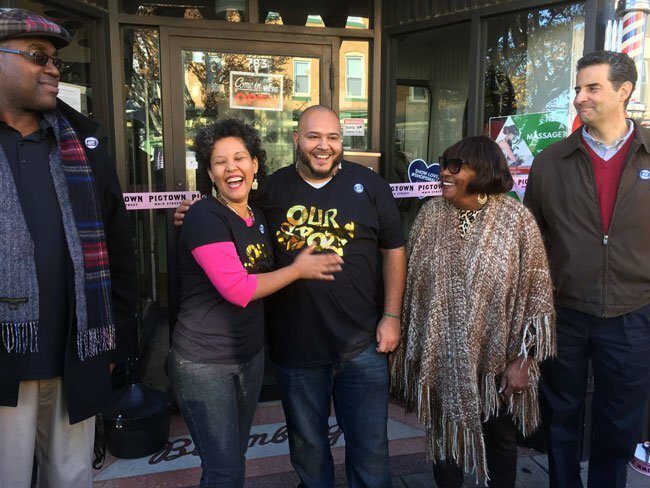 Ben Hyman, executive director of the Pigtown Main Street nonprofit, sat down with MDBizNews to discuss the revitalization happening in the neighborhood, including the recent success of a record-breaking year investing more than $110,000 into Pigtown businesses through grants and loans. Tell us a little about the history of the Pigtown Main Street organization. Pigtown Main Street is a nonprofit organization that was founded in 2000. We are dedicated to the Washington Boulevard commercial corridor in Pigtown, a neighborhood of Southwest Baltimore, to spur neighborhood revitalization. We provide technical assistance to small business owners and their landlords to catalyze economic development, create jobs, and attract residents and visitors to Pigtown. What are some challenges businesses in Pigtown have faced? How are they overcoming those challenges and how has your organization assisted? We help businesses with the basics – from securing permits to social media support. We also address issues that affect all of our businesses, like dirty streets and public safety. For new businesses, we guide them through the leasing process, including site selection, lease negotiation, business plan development, and securing permits and loans for fit-up. We focus on the barriers that our businesses face so that they can thrive and we never charge for our services! What have been some of the most notable successes over the years for Pigtown's economy and quality of life? Over the past five years, we've recruited dozens of new businesses to Pigtown, catalyzing millions in investment and dozens of new jobs. Some of my favorites are Culinary Architecture, a woman-owned gourmet market; Suspended Brewing Company, Pigtown's first brewery; and 9/10 Condition Sneaker Boutique, which sells high-fashion sneakers. Each of these businesses helps give Pigtown a unique sense of place and creates a destination for local residents and visitors. What is a challenge facing the Pigtown neighborhood? Pigtown is one of the last neighborhoods within walking distance of downtown that has not completed developed. At Pigtown Main Street, we work to address the issues holding back the business district – and the neighborhood – while preserving our unique sense of place. Where do you see Pigtown in 10 to 15 years? I envision Pigtown as a neighborhood on par with Baltimore's most successful neighborhoods that welcomes residents and visitors of all kinds with great local restaurants, thriving boutiques, and engaging nightlife. What would you say to businesses on investing in Pigtown? How can your organization be an asset? Pigtown is two blocks from downtown, three blocks from the University of Maryland, and served by I-95, MD-295 and the MARC train. We are a great and affordable option for a business looking to market to customers downtown and throughout the region, and we have great parking. Pigtown Main Street works with business owners through every step, helping them open a location and supporting them once they're here to achieve their goals. Better yet, our services are always free to small businesses. Why is the Annual Pigtown Festival so important to its local businesses and residents? The Pigtown Festival attracts more than 5,000 people to Washington Boulevard for live music, dozens of local vendors, and our famous live pig races. It helps foster our originality and generates foot traffic and sales to our local merchants. For more information on Pigtown Main Street or to open a business in Pigtown, visit PigtownMainStreet.org or call 443-908-7038.